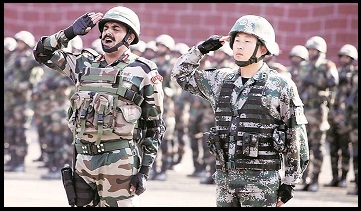 The 7th India and China joint military exercise -'Hand in Hand' begins from 11th December 2018, in southwest China's Chengdu city. The joint military exercise 'Hand in Hand' is a 14-days drill scheduled to be held from 11th December and will conclude on 23rd December 2018. 4The exercises will be held after a gap of one year as both the sides were packed in a 73-day standoff in Doklam in the Sikkim sector of the border in 2017. The joint military exercise 'Hand in Hand' aims at promoting understanding between the two militaries and improving their capabilities in fighting terrorism. The joint military exercise 'Hand in Hand' witnessed 100 troops from both the countries with main focus is on counter-terrorism operations. It includes live shooting and adoptive and basic training, he said, adding that true to its name 'Hand in Hand', China and Indian militaries should also work hand in hand for the benefit of people of India and China.